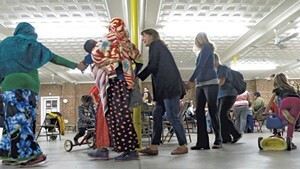 People who use the Janet S. Munt Family Room, a Burlington parent-child center with free programs designed to strengthen families, on Thursday decried cuts there that have cost some workers their jobs. 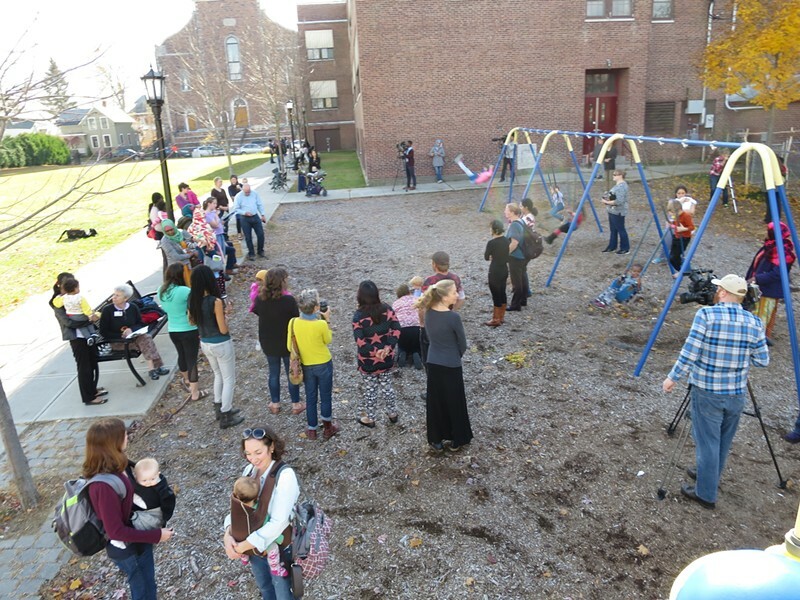 Families and children gathered outside the Allen Street school that houses the program and shared stories about what it has meant to them. Those who run it learned October 1 that its application for close to a half million dollars through the federal New Pathways for Fathers and Families "Dads" grant — a grant they've gotten for nine years — was turned down. The Family Room has since cut three veteran workers and reduced its programs. The Family Room is part of the Visiting Nurse Association of Chittenden and Grand Isle Counties. The Family Room's parent advisory council has organized three public meetings to discuss raising funds to restore the staff and programs. Thursday, they held an appreciation luncheon and presented scrapbooks to the departing staff. 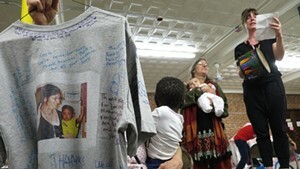 The council also organized Thursday's speak-out, so parents could express how much the Family Room's staff and programs meant to their families. Jennifer Tornabe's children — Jordan, 7, and Jasmine, 5 — were with her while she put the finishing touches on a project she'd been working on — scrapbooks full of notes and photos for the three employees who've had their jobs cut. "It's symbol of them taking a piece of us when they go," the 37-year-old South End resident said.